-History: Zaraxus has lived a long life, but not long enough for his liking. His brood was killed by hunters and his egg pilfered by them and the stolen by elves. Hatched and raised among the gainers folk has given this dragon an awkward point of view, compared to others of his kind. He has gone through most of his life doing nothing but indulging his own wants and desires. Having outlived even his elven 'parents' Zaraxus holds no real sense of loyalty to anyone, except himself. Recently having taken an interest in collecting rare books and ancient manuscripts, the blue dragon has taken to traveling all around the world, adding to his growing 'horde'. -Traits:(what makes this class unique.) When a dragon dwells on and expands his magical repertoire, they become a frightening force of nature, often specializing in the magic that runs innately through their blood. - Storm Magic - The ability to create, control, and dismiss storms. Directing lightning bolts and wind and rain by pure will alone. 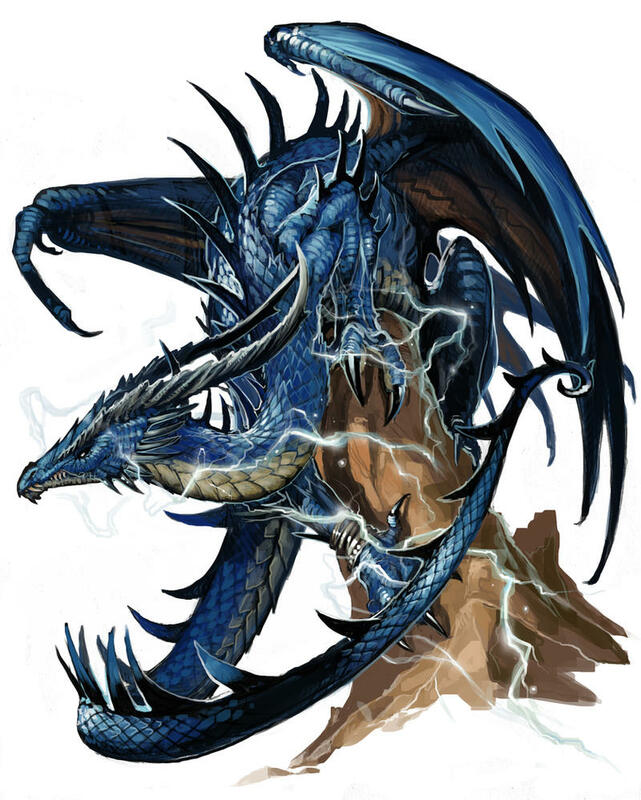 - Shapeshifting - The ability to take one of three forms: His dragon form, in all of its draconic splendor, and Elven form, the one he uses most commonly, and a hybrid of sorts, mostly elven but with sapphire blue dragon wings, elongated finger nails for claws, and a maw full of razor sharp teeth. - Sandstorm - As blue dragons are native to the deserty areas, they gain a semblance of control over the dunes and dust storms. - Desert Thirst - Water is vital in the desert, and, as masters of their domain, Blue Dragons can create and destroy water at will. This is limited by their age, as older dragons can dry up an oasis with nary but a thought. - Mirage - Able to play with the refraction of light, blue dragon mages are able to do a great many illusions with their mastery over it. From going invisible to making copies of themselves or other things. Skills/Spells: All of the skills listed above (In both the class and race sections), and most lower level magics, with a certain deficiency in ice and acid spells. (And by magic I mean arcane, he doesn't have any of that healing or holy power stuff) His electric magic, however, is very advanced.